At Ararat North Primary School our mission is to provide every student with rich learning opportunities in a happy, safe and inclusive educational setting. Nestled within extensive native gardens, Ararat North is a modern, open-planned school located in the northern area of Ararat. The school serves a number of families within the township and from outlying areas to the north and east of the city. Our school’s buildings provide a stimulating learning setting. The main school structure is an attractive, open-plan design, comprising six learning areas surrounding a large central hub and an open art room. The school also has outstanding kitchen facilities, a multi purpose hall and a foyer and administration area. The Ararat North Kindergarten and Ararat North Occasional Care are also located on the school-grounds, making our Ararat North Centre the only Birth to Year 6 precinct in Ararat. 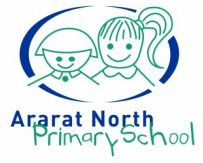 Ararat North Primary School has the lowest teacher-student ratio within the city limits. We implement rigorous and consistent whole school English and Mathematics programs for all students. Our teachers work as a team to provide high quality planning and individual excellence in student learning. - French as a Language Other Than English coming in 2019!